Between erecting a shantytown in Harvard Yard and disrupting a South African official’s speech in the Science Center, anti-apartheid activists at Harvard in the late 1980s pressured the University to fully divest from companies with ties to South Africa. Even after Harvard tried to placate critics with a policy of “selective divestment,” student activists continued to protest any investment in South Africa. Activist pressure played a key role in pushing the University to reduce its South African holdings significantly, ultimately leading to a decrease of $230 million in South Africa-based holdings between June 1986 and January 1987. South Africa’s system of apartheid was first instituted after World War II, and worldwide opposition to the system of forced racial segregation developed quickly. In the late 1970s, a significant movement to divest from South Africa began. It aimed to use economic isolation to pressure the apartheid government to change its policies. 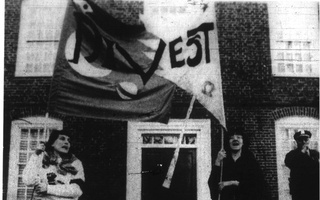 As the movement spread throughout the United States, Harvard resisted calls to withdraw its investments and the original movement eventually lost momentum. However, Harvard activists in the late 1980s were reinvigorated by Jesse Jackson’s visit in April of 1985. In front of thousands of Harvard students and onlookers, Jackson denounced apartheid and urged students to “choose the moral high road,” according to a 1985 Crimson article. “We as undergraduates realized that this was a national movement and that what happened at Harvard mattered,” said Jonathan E. Martin ’88, reflecting on Jackson’s speech. Within a year, though, Rossinow found his political alliances shifting. “When I saw that organized, vowed conservatives were such enthusiastic supporters of this despicable regime, that basically severed my ties to Conservatism as a political identity,” he said. As one of the largest campus groups trying to increase awareness about apartheid, SASC used sit-ins and protests to urge the University to divest from companies in South Africa. Anti-divestment protests came to a head in April 1986 when SASC led the construction of a symbolic ‘shantytown’ in the middle of Harvard Yard. Over 200 activists carried the components of the shantytown and their symbolic, 16-foot tall “Ivory Tower” under the cover of darkness, completing their work at 2:15 A.M. on April 16, 1986. The shantytown became a living protest, with students sleeping in the settlement and some professors and teaching fellows even holding classes there. Although many students were sympathetic towards the cause, not everyone was on board. The settlement received a bomb threat on April 18, and on April 22, the Conservative Club built a ‘Gulag’ in the Yard to draw attention to University investment in the Soviet Union. But as Commencement loomed closer, some students called for the activists to dismantle the settlement to avoid interfering with the event. Ultimately, one-fourth of the Class of 1986 signed a petition calling for its removal. Meanwhile, the University and the activists were at a standoff; student activists were unwilling to dismantle the shantytown unless the University fully divested, but the University was steadfast in its opposition to doing so. Although SASC members voluntarily removed most of the shanties two days after Commencement, they left some of the larger structures standing. Administrators took down the last remnants of their protest without the group’s consent, clearing the area where present-day Occupiers would set up a ‘tent city’ 25 years later in the fall of 2011. Despite the controversy surrounding their actions, these students looked back on the shantytown as one of the most successful of their initiatives. After administrators dismantled the shanty town, anti-apartheid activists were left questioning how to best proceed against staunch University opposition to their demand for full divestment. Sit-ins and protests continued, coming to a peak a year later. On March 24, 1987, members of SASC once again seized the limelight when their “symbolic blockade” of the Science Center ended in controversy and an unexpectedly strong administrative backlash. South African Vice Consul Duke Kent-Brown had begun his speech in the Science Center when around 20 members of SASC left their seats and blocked off the two bottom exits of the auditorium, according to a 1987 Crimson article. The students, who sang and interlocked arms while blocking the exits, claimed their goal was simply to ensure that Kent-Brown walked through an ongoing rally outside the Science Center. Harvard administrators were prepared for the blockade and suspected that the students would attempt to protest at the event. Harvard Dean of Students Archie C. Epps III had organized numerous meetings with the students throughout the semester to remain informed of their plans. Fourteen of the students were later found guilty by the Administrative Board of disrupting the speech and were placed on disciplinary probation. Originally, Epps filed up to six charges against each of the undergraduates, although some of the charges were eventually dropped. According to Mitchell A. Orenstein ’89, what was supposed to be a standard, run-of-the-mill protest became an overblown controversy. 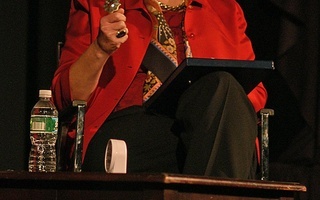 For some participants, the resulting controversy over disciplinary action and freedom of speech soon overshadowed their anti-apartheid efforts. Overall, Harvard’s largest student movement of the 1980s began to die down in spring of 1987, and enthusiasm for the movement was not as strong as it once was. “The energy in an activist group is never continuous at the same level. It kind of ebbs and flows, and there are all sorts of reasons why that could be,” said Rossinow. By the spring of 1987, Harvard had sold most of its stocks and bonds in Texaco, Shell, Mobil, and Ford, cutting its investments in South Africa nearly in half. The move reduced Harvard’s South Africa-linked holdings to their lowest level since 1983. The decision was partly due to pressure from the activist community, Treasurer of the University Roderick M. MacDougall ’51 said at the time. Although activists insisted it was not enough, Harvard’s decision to selectively divest from companies in 1987 “[took] a toll” on the student movement, said Orenstein in 1987 to the Crimson. By May of 1987, University President Derek C. Bok asserted that divestment activism had declined, an observation that was affirmed by a spokesman for SASC. “A lot of intellectuals are rethinking if divestment is responsible,” said Orenstein to the Crimson at the time. Just seven years after the Class of 1987 marched at Commencement—crossing the very ground where the shantytown had stood the year before—Nelson Mandela was elected President of South Africa. For student activists, this was a monumental milestone that helped to validate their efforts at the College. Thomas J. Winslow ’87 did not participate in the protests at the time, aside from visiting the shantytown in Harvard Yard once to watch an educational video. After graduation, however, he moved to South Africa, where he witnessed the South African Air Force flying a salute to the newly-inaugurated president in 1994. Looking back, he recognized the powerful role student activism played in the anti-apartheid movement. After graduating, Grossman traveled to South Africa several times, allowing him to observe the country’s transition. “It’s very fulfilling to know you are on the right side of history,” Grossman said. —Staff writer Michael C. George can be reached at mgeorge@college.harvard.edu.